There ain’t many viruses, malwares or potential security threats that targets Windows Mobile Pocket PC (PPC) wireless devices yet, but that doesn’t mean protection is not required. In fact, virus, although less, may still infect a WM mobile devices when user download and run an infected program from non-trusted websites, or via infrared, Bluetooth, Wi-Fi and USB connection or during synchronization process with compromised PC. Windows Mobile device, either a Pocket PC or communicator that is infected with virus may become a zombie that used to send out paid SMS/MMS, email spam messages, infected files or made unauthorized calls to premium numbers. And the malware may steal personal data such as contacts, mail addresses, personal files, Internet surfing stats, online purchase info, passwords, private financial info of an accounting program, organizer schedules and etc. The phone may also becomes unstable, has function blocked, has shorter batter life or even has complete or partial data loss. Dr.Web Anti-Virus for Windows Mobile can protect communicators, mobile phones and Pocket PCs against viruses and other threats targeting wireless. Dr.Web Anti-Virus for Windows Mobile is launched automatically as soon as an operating system is loaded. Each file received by a device during synchronization or downloaded via GPRS/Infrared/Bluetooth/Wi-Fi/USB is checked for viruses real-time “on-the-fly”. Dr.Web will temporarily blocked any infected files and then alert the user, who can then choose to ignore, delete or move the object to the “Quarantine” directory. On-demand manual updating via HTTP using a built-in GPRS module, using Infrared/Bluetooth/Wi-Fi/USB connection or using ActiveSync connection when synchronize with a PC. Dr.Web Anti-Virus for Windows Mobile supports any communicator or Pocket PC running Windows Mobile 2003/2003 SE/5.0/6.0/6.1. And Dr.Web Anti-Virus for Windows Mobile is available for free with no cost to all registered customers of commercial licenses for Dr.Web for Windows (except for Dr.Web AV-Desk subscribers). 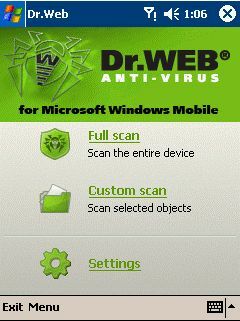 Dr.Web Anti-Virus for Windows Mobile uses the same key file with Dr.Web Anti-Virus for Windows. So, all Doctor Web Anti-Virus, Dr. Web Anti-Virus&Anti-Spam and Dr.Web SOHO license can use the same license key files to activate Dr.Web Anti-Virus for Windows Mobile free of charge. Good news is that now it’s possible to grab a free 1 year Dr.Web Anti-Virus license key file serial number. Then, users can use the free key file to activate the Dr.Web Anti-Virus for Windows Mobile. For users who just want to try out the product, get a demo key file for Dr.Web for Windows or a key file for the “SOHO” bundle, and then transfer the key to to Windows Mobile installation directory.